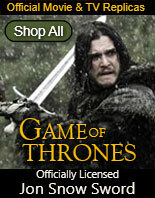 Sinbad Pirate Swords for sale are 37 inches in all. The Sinbad Pirate Sword features a curved scimitar style blade that is accented by a red and black colored wooden handle. The two colors on the handle are divided by a mirror polished chrome spacer. The chrome spacer matches the bulbous chrome pommel and shiny swirled handle. These swords have a 26 ½ inch, sharpened stainless steel blade and include a black imitation leather scabbard which snaps shut. 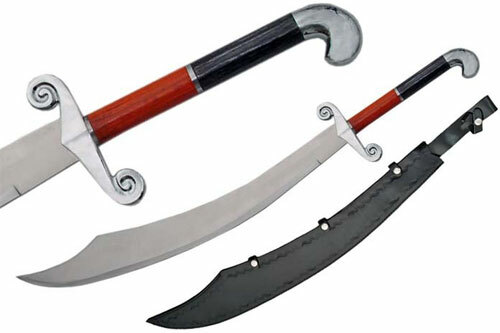 Buy these popular Sinbad Pirate Swords for $59.99.